Enjoy the interview with Deborah Harkness and enter to win at the end. Q: A Discovery of Witches debuted at # 2 on the New York Times bestseller list with publications following in 37 countries. What has been your reaction to the outpouring of love for A Discovery of Witches? Was it surprising how taken fans were with Diana and Matthew’s story? A. It has been amazing—and a bit overwhelming. I was surprised by how quickly readers embraced two central characters who challenge our typical notion of what a heroine or hero should be. And I continue to be amazed whenever a new reader pops up, whether one in the US or somewhere like Finland or Japan—to tell me how much they enjoyed being caught up in Diana’s world. Q: Last summer, Warner Brothers acquired screen rights to the trilogy, and David Auburn, the Pulitzer-Prize-winning writer of Proof, has been tapped to pen the screenplay. Are you looking forward to your novels being portrayed on the big screen? What are your favorite casting ideas that you’ve heard from friends and readers? A. I was thrilled when Warner Brothers wanted to translate the All Souls trilogy from book to screen. At first I was reluctant about the whole idea of a movie, and it actually took me nearly two years to agree to let someone try. The team at Warner Brothers impressed me with their seriousness about the project and their commitment to the characters and story I was trying to tell. Their decision to go with David Auburn confirmed that my faith in them was not misplaced. As for the casting, I deliberately don’t say anything about that! I would hate for any actor or actress to be cast in one of these roles and feel that they didn’t have my total support. I will say, however, that many of my readers’ ideas involve actors who have already played a vampire and I would be very surprised if one of them were asked to be Matthew! Q: SHADOW OF NIGHT opens on a scene in 1590s Elizabethan England featuring the famous School of Night, a group of historical figures believed to be friends, including Sir Walter Raleigh and playwright Christopher Marlowe. Why did you choose to feature these individuals, and can we expect Diana and Matthew to meet other famous figures from the past? A. I wrote my master’s thesis on the imagery surrounding Elizabeth I during the last two decades of her reign. One of my main sources was the poem The Shadow of Night by George Chapman—a member of this circle of fascinating men—and that work is dedicated to a mysterious poet named Matthew Roydon about whom we know very little. When I was first thinking about how vampires moved in the world (and this was way back in the autumn of 2008 when I was just beginning A Discovery of Witches) I remembered Roydon and thought “that is the kind of identity a vampire would have, surrounded by interesting people but not the center of the action.” From that moment on I knew the second part of Diana and Matthew’s story would take place among the School of Night. And from a character standpoint, Walter Raleigh, Christopher Marlowe, George Chapman, and the other men associated with the group are irresistible. They were such significant, colorful presences in Elizabethan England. Q: In SHADOW OF NIGHT, we learn more about the alchemical bonds between Diana and Matthew. In your day job, you are a professor of history and science at the University of Southern California and have focused on alchemy in your research. What aspects of this intersection between science and magic do you hope readers will pick up on while reading SHADOW OF NIGHT? A. Whereas A Discovery of Witches focused on the literature and symbolism of alchemy, in Shadow of Night I’m able to explore some of the hands-on aspects of this ancient tradition. There is still plenty of symbolism for Diana to think about, but in this volume we go from abstractions and ideals to real transformation and change—which was always my intention with the series. Just as we get to know more about how Elizabethan men and women undertook alchemical experiments, we also get to see Matthew and Diana’s relationship undergo the metamorphosis from new love to something more. 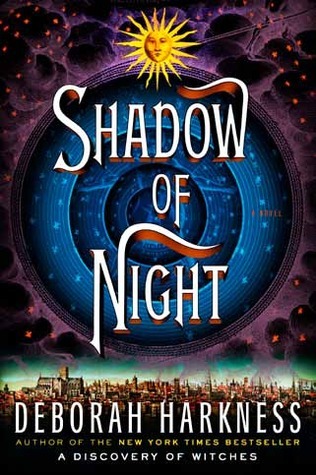 Q: SHADOW OF NIGHT spans the globe, with London, France, and Prague as some of the locales. Did you travel to these destinations for your research? A. I did. My historical research has been based in London for some time now, so I’ve spent long stretches of time living in the City of London—the oldest part of the metropolis—but I had never been to the Auvergne or Prague. I visited both places while writing the book, and in both cases it was a bit like traveling in time to walk village lanes, old pilgrim roads, and twisting city streets while imagining Diana and Matthew at my side. Q: Did you have an idea or an outline for SHADOW OF NIGHT when you were writing A Discovery of Witches? Did the direction change once you sat down to write it? A. I didn’t outline either book in the traditional sense. In both cases I knew what some of the high points were and how the plot moved towards the conclusion, but there were some significant changes during the revision process. This was especially true for SHADOW OF NIGHT, although most of those changes involved moving specific pieces of the plot forward or back to improve the momentum and flow. Q: A Discovery of Witches begins with Diana Bishop stumbling across a lost, enchanted manuscript called Ashmole 782 in Oxford’s Bodleian Library, whose secrets Diana and Matthew are still trying to uncover in SHADOW OF NIGHT. You had a similar experience while you were completing your dissertation. What was the story behind your discovery? And how did it inspire the creation of these novels? A. I did discover a manuscript—not an enchanted one, alas—in the Bodleian Library. It was a manuscript owned by Queen Elizabeth’s astrologer, the mathematician and alchemist John Dee. In the 1570s and 1580s he became interested in using a crystal ball to talk to angels. The angels gave him all kinds of instructions on how to manage his life at home, his work—they even told him to pack up his family and belongings and go to far-away Poland and Prague. In the conversations, Dee asked the angels about a mysterious book in his library called “the Book of Soyga” or “Aldaraia.” No one had ever been able to find it, even though many of Dee’s other books survive in libraries throughout the world. In the summer of 1994 I was spending time in Oxford between finishing my doctorate and starting my first job. It was a wonderfully creative time, since I had no deadlines to worry about and my dissertation on Dee’s angel conversations was complete. As with most discoveries, this discovery of a “lost” manuscript was entirely accidental. I was looking for something else in the Bodleian’s catalogue and in the upper corner of the page was a reference to a book called “Aldaraia.” I knew it couldn’t be Dee’s book, but I called it up anyway. And it turned out it WAS the book (or at least a copy of it). With the help of the Bodleian’s Keeper of Rare Books, I located another copy in the British Library. Q: Are there other lost books like this in the world? A. Absolutely! Entire books have been written about famous lost volumes—including works by Plato, Aristotle, and Shakespeare to name just a few. Libraries are full of such treasures, some of them unrecognized and others simply misfiled or mislabeled. And we find lost books outside of libraries, too. In January 2006, a completely unknown manuscript belonging to one of the 17th century’s most prominent scientists, Robert Hooke, was discovered when someone was having the contents of their house valued for auction. The manuscript included minutes of early Royal Society meetings that we presumed were lost forever. Q: Unlike Twilight’s Bella and Edward—hormonal teenagers who meet in the halls of a high school—your leading characters Matthew and Diana are established academics who meet in the library of one of the most prestigious academic institutions in the world. This is a world where vampires and witches drink wine together, practice yoga and discuss philosophy. Are these characters based on something you found missing in the fantasy genre? A. There are a lot of adults reading young adult books, and for good reason. Authors who specialize in the young adult market are writing original, compelling stories that can make even the most cynical grownups believe in magic. In writing A DISCOVERY OF WITCHES, I wanted to give adult readers a world no less magical, no less surprising and delightful, but one that included grown-up concerns and activities. These are not your children’s vampires and witches. Girl Who Reads is an Amazon advertising affililate; a small fee is earned when purchases are made at Amazon through the links above. The giveaway is sponsored by the publisher. GAH!!! I would absolutely LOVE to win this!! Thanks for the great interview with Ms. Harkness too! I hadn't heard that the movie rights had been sold, so that's exciting to hear. It's got to be hard as an author to imagine your massive book(s) being turned into a movie, which means they necessarily have to cut out SO MUCH. But it's great that they have such a respected writer working on the screenplay. Still, I hope she gets to have lots of involvement in how it's made, if she wants to. Thanks so much for the giveaway!!! I am so excited! It would be wonderful to win this and read the book before the movie comes out. It adds some magic to the story, knowing it will be on the big screen and I like reading the book before hand. I love this series too and can't wait for the movies. I rarely go to the "real" theatre (wait until it goes to the discount theatre), but this one I might have to go to opening night.